Web of trust (WOT) is a popular Addon for browsers which allows you to Browse the Website safely. It helps you detect which web site are harmful, infected, infect your computer with malware and all kinds of other bad stuff. It’s free and easy-to-use. The WOT add-on can be installed in the Firefox, Internet Explorer, Google Chrome, Opera and Safari Internet browsers. Its easy to use just install the add on on your browser, than it appears as a small icon on your browser address bar. 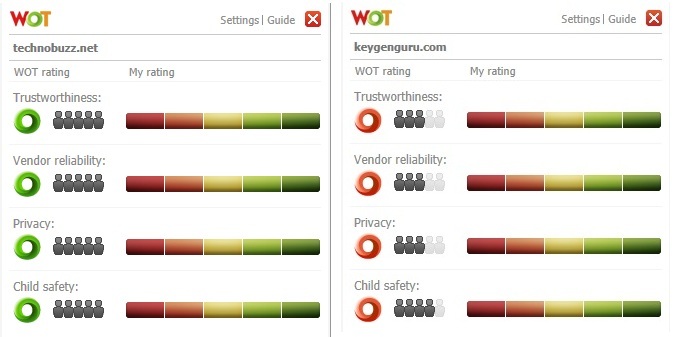 The icon changes color depending on the quality of each particular Web site you visit, based on other users’ ratings. A dark green icon means you’re in the clear, while a red one is cause for serious concern; orange, yellow, and light green cover the areas in between. You can Download WOT Add-on for Mozilla Firefox, Internet Explorer, Safari, and Opera here.